Catching a glimpse of a shiny typewriter in her father’s store window, young Rose Pamphyle (Déborah François) hatches a plan to escape her provincial life and transform herself into an independent and intrepid modern woman in Populaire, Régis Roinsard’s highly stylized debut that tips its hat to the 1950s heyday of Rock Hudson and Doris Day. Embarking on a trip to Lisieux, Normandy, to interview for a secretarial position at Échard and Sons Insurance, Rose encounters glorified bachelor Louis Échard (played by dashing French actor Romain Duris), who takes pleasure in scoping out the comely applicant pool until Rose’s preternatural typing ability stops him in his tracks. Clearly impressed, he offers her a job on the spot, although he soon discovers she makes a terrible secretary, often accidentally shredding documents and using his arm to take messages when pen and paper are scarce. Taking Rose aside, Louis confides that there is only one way for her to save her job. Indignant after mistakenly presuming that he’s trying to take advantage of her youth and naivety with an illicit ultimatum, Rose soon discovers that Louis merely intends to transform her into a champion speed typist. Competitive through and through, Louis assumes the role of Rose’s coach, teaching her how to touch type and expand her lexicon by transcribing novels such as Flaubert’s Madame Bovary. Proving himself to be an unusually invested mentor, Louis convinces Marie (Bérnicé Bejo of The Artist), his former childhood sweetheart, to give the impressionable Rose piano lessons to improve her dexterity. He also ends up allowing her to move into his home so she won’t have to commute long hours or clash with the austere old women who run the boarding houses in town. As Rose trains harder and harder and begins winning typing contests, sparks fly between the pair. However, though she hopes to pursue a relationship, Louis tries desperately to maintain the platonic status quo, even cruelly kicking her out at Christmas to spend the holidays with her estranged family. Nevertheless, Rose proves imperturbable and manages to break down the defenses that Louis has constructed to avoid contending with a painful past that involves trauma from World War II and losing Marie to friend and American expat Bob Taylor (Shaun Benson). In fact, Populaire revolves around Rose saving Louis from his own insecurities as a former athlete and rejected lover as much as it does around her striving to overcome her small-town trappings to achieve success. With influences ranging from Billy Wilder and Stanley Donen to Douglas Sirk and Jacques Demy, Roinsard revealed that he wanted Populaire to feel at once like an homage to films of the ‘50s as well as a very contemporary picture. Inspired by a documentary on the history of the typewriter, he teamed with Daniel Presely, an American friend, to write the script and admitted that the friendship between Louis and Bob emulates their own. Roinsard also discussed the correlation between speed and progress, particularly as it relates to Rose’s upward mobility from small-town secretary to practically a bona fide sports hero. Although Populaire sometimes stumbles on rom-com clichés, it possesses a charm and satirical edge that elevates the material. From the start, the film emphasizes how Rose regards secretaries as the epitome of modernity. While this tongue-in-cheek confession serves as a testament to the lack of options for women of the time, it also proves an ironic, self-fulfilling prophesy when Rose achieves success by subverting the conventional use of the typewriter to free herself from the constraints of the hierarchical workplace. Instead, she trains and is treated like an award-winning athlete whose male coach cheers her on from the sidelines. François, who has captivated audiences ever since her debut in the Dardenne’s Palme d’Or-winning L’Enfant, brings intelligence, humor, and warmth to a role which in less capable hands might have turned into yet another clueless, blonde ingénue. Meanwhile, Duris, who has most noticeably appeared in Jacques Audiard’s mesmerizing The Beat That My Heart Skipped (2005), rises to the challenge, revealing Louis’s vulnerability beneath his bossy, sleek exterior. The film also impresses with its stunning cinematography, courtesy of Guillaume Schiffman (who was nominated for an Academy Award for Michel Hazanivicius’s The Artist), while Sylvie Olivé and Charlotte David provide sumptuous set and costume design, respectively. Rob and Emmanuel d’Orlando contribute an ebullient score with jazz standards throughout as Laure Gardette and Sophie Reine’s brisk editing during the competition sequences in particular transforms stationary typing into a thrilling race to the finish line. In addition, the film delights in representing the tension between France and the United States, with Rose even facing an American opponent in the championship. The film seems to relish implying the complete and utter ineffectiveness of American capitalism when Rose defies her new role as a spokeswoman for an American typewriting company after the carriage gets stuck mid-competition and she decides to replace it with her very first typewriter. However, this foreign dichotomy sometimes dips into heavy-handed territory, as when Bob proclaims, “America is for business. France is for love” at the end. Occasionally Populaire falters by trying too hard to cater to both French and American audiences, following on the heels of international hits that employed similar tactics, including last year’s The Artist and The Intouchables. Nevertheless, Populaire, an intriguing if not entirely perfect portrait of progress in motion, is boosted by François and Duris’s old-school charm, not to mention palpable chemistry, as well as the film’s feat of appearing both nostalgic and forward-looking in turn. 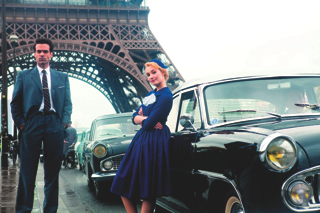 Populaire won the First Feature Award at ColCoa. The Weinstein Company is heading up domestic distribution and will release the film on September 6.